Vatan is an example of New York’s ability to integrate so many cultures into the everyday. We are originally from India, so we love Indian food. We rarely cook traditional Indian food at home though- our cuisine is more of a fusion of various cultures (Indian, American, Italian, Greek, etc.) Vatan is always a treat. 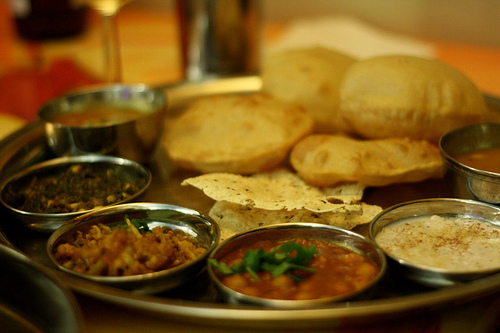 It’s Gujarati food, which is vegetarian, but even the most die-hard carnivore will be satisfied. We love our meat and fish, but Vatan makes us forget about such items with their perfectly crisp samosas and salty-sweet batatavadas. And that’s just the appetizers. For a $30 prix-fixe, one gets 3 thalis: the first with appetizers, the second with entree items, and the third with dessert (fabulous chai tea and mango ice cream). Now, the only warning is that while the entree thali is delicious, the appetizer and dessert thalis steal the show. Regardless, all the food is amazing. So, go prepared to eat and spend time with the ones you loved.